The Texas Department of Public Safety is making security and staffing improvements on the state’s border with Mexico. But other parts of Texas will continue to feel a public-safety void while the agency continues pouring resources near the Rio Grande, its director said on Tuesday. 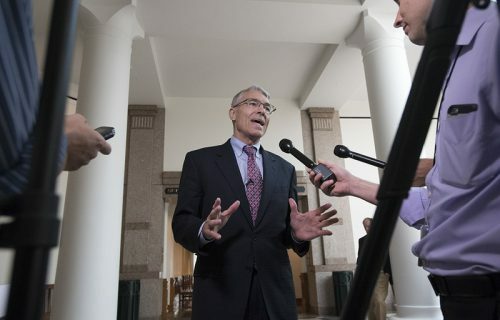 The testimony from Col. Steve McCraw came during a House Appropriations Committee hearing on how the state’s police force is spending its share of the record $800 million lawmakers appropriated for border security in 2015. McCraw said the agency was getting closer to its goal of hiring 250 troopers for permanent placement on the border, mainly in Starr and Hidalgo counties. But because the agency cannot place rookie agents on the border alone for six months, and because it has to make up for statewide attrition, it will continue rotating officers from across the state for temporary stints in the area. “Are any of our other areas being left without adequate protection?” State Rep. Helen Giddings, D-Dallas, asked McCraw. “Yes ma’am. There is an impact,” he said. “We’re mindful of that, of course. But we’ve been provided some very direct guidance in terms of prioritization” by lawmakers. There are more than 200 new troopers on the border now, McCraw said. And with graduating classes coming later this year, the 250 goal will be met by December. But the rotations that sap resources from other regions will continue for months, he said. “When they can operate by themselves to the point when they don’t need the field training officer, [that] will take time depending on which school graduates,” he said. Giddings asked the director how he would describe the agency’s greatest accomplishments to date, and what she could tell people in Dallas they should feel good about. McCraw said the border surge has helped seal off one of the biggest smuggling corridors on the border, which affects the rest of Texas and beyond. After the hearing, Giddings said she understands the size of Texas and scope of border security puts McCraw in a tough position. But she said she wasn’t satisfied with his response because it’s not something her constituents can measure. Lawmakers did praise McCraw’s unveiling of a work in progress to measure the effectiveness of the border operation. During debate on the legislation in 2015, some lawmakers, specifically Democrats, were critical of what they said was the agency’s inability to define progress. McCraw said he asked former state auditor John Keel for guidance to develop a plan, which he said must be approved by lawmakers. But he said it’s a change from merely tallying arrests and seizures and using those figures as a measuring stick. State Rep. Donna Howard, D-Austin, who has been a vocal critic of the border allotment, thanked McCraw for listening to lawmakers and trying to provide answers. This entry was posted in KRTS News and tagged Border Security, Border Security Spending, Law Enforcement, Texas Border Surge, Texas DPS, Texas House Appropriations Committee, Texas Legislature, Texas Tribune. Bookmark the permalink.